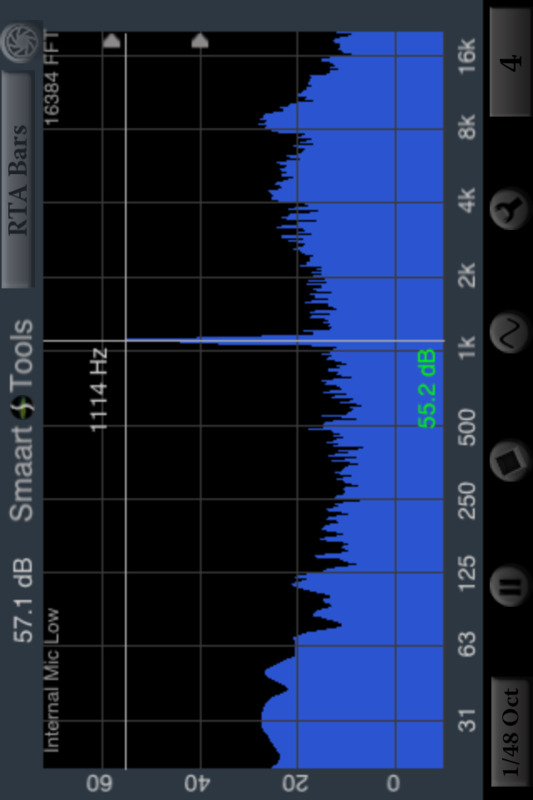 SmaartTools for iOS single channel RTA is a full-featured audio spectrum analyzer based on the single-channel portion of Smaart 7 by Rational Acoustics. If you need a two-channel FFT for your iOS device, check out Transfer Function, a module in our AudioTools app. Smaart Tools was developed by Studio Six Digital in collaboration with Rational Acoustics and is based on the proprietary algorithms, techniques, features & color mapping found in the SmaartÂ® v.7 acoustic test and measurement software. Now, you can have the sophisticated analysis of SmaartÂ® on the iPhone and iPod touch mobile platform. The single-channel module includes the following features from SmaartÂ® v.7: the RTA Bar graph, RTA Line graph, RTA Bar & FFT graph, and the Spectrograph. On the iPhone and iPod touch, there is an additional graph, the Spectrograph with the RTA Line graph on top of it. All of the RTA banding options available in SmaartÂ® v.7 are available, including log, lin, Octave, 1/3rd, 1/6th, 1/12th, 1/24th and 1/48th Octave modes. The decay modes from SmaartÂ® v.7 are also available, and include None, 1, 2, 4, 8, and 16 averages, and the Smaart 1-10 second custom decay settings, as well as Infinite, Fast, and Slow. The frequency scale can be zoomed down to a single octave, and the dB scale can be zoomed down to 1dB resolution. Double-tap the screen to return to full frequency response, and to auto-scale the dB scale. Real-time Spectrograph history is saved, just swipe to see sound events that have scrolled off the screen. Other features include high-contrast mode, variable Spectrograph speed, vertical or horizontal running Spectrograph, Difference mode, Peak Tracking, and FFT Windowing. All of the standard AudioTools features, such as Save / Recall and the Generator Panel are available. All settings are automatically saved and restored the next time that you run the app. On iPad and larger iPhones, split graph mode is available, so that you can put any two graphs on the screen at the same time. Check out the screenshots to see if your device supports them. Smaart Tools RTA Spectrum works great with the built-in iOS device microphone, as we have proprietary microphone compensation and calibration database derived for every iOS device. To upgrade to full professional results, use our iTestMic, or iAudioInterface2 with any test & measurement microphone. Also see our other great audio test and measurement apps.